Intercreate.org is a project based organisation consisting of an international network of people interested in art, science, culture and technology. Our motto is developing the culture to create a sustainable civilisation. We are based in Aotearoa New Zealand. We live in a world where the human connection to the environment is having a strong negative impact, particularly for the generations that follow. At Intercreate we believe an important part of resolving the problems around the human relationship with the environment, is to involve indigenous groups in all discussions of the environment. Consequently we are working with partners to ensure this is a component of our major projects. Our projects and residencies have a strong focus on environment, regionally, nationally and internationally. Intercreate Trust was formed in 2007 and is a registered charitable entity as specified by the New Zealand Charities Act 2005. For more information about the Intercreate Trust, please visit the Charities Register at www.charities.govt.nz (our registration number is CC32791). Trustees and associates are listed below. The organisation arose from the Solar Circuit Aotearoa New Zealand (SCANZ) residency in 2006. The first SCANZ was organised by Nina Czegledy, Adam Hyde, Ian Clothier and Trudy Lane. SCANZ aims to integrate art, science, culture, technology and indigenous awareness. 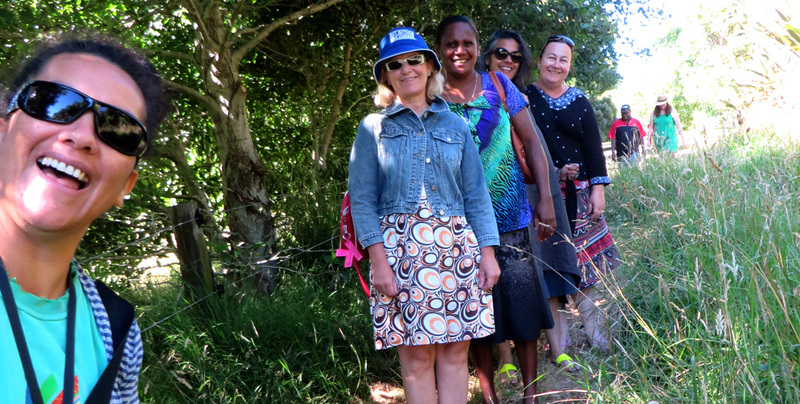 Nina Czegledy (Chair), Dr Tracey Benson (Secretary/Treasurer), Wayne Morris, Trudy Lane, Dr Leah Barclay and Jo Tito. Andrew Hornblow is the trust Creative Engineer while Ilka Blue Nelson is responsible for Social Media. Projects have included five SCANZ events – in 2006, 2009, 2011, 2013 and 2015 – involving residency, exhibitions and public presentation, workshops, and hui/symposia. Since 2011 Intercreate has worked closely with Dr Te Huirangi Waikerepuru and Te Matahiapo on several projects. Wai was presented at ISEA 2012 Albuquerque Machine Wilderness. Te Kore Rongo Hungaora: Uncontainable Second Nature was curated for ISEA 2011 Istanbul and also presented in Rio de Janeiro at Cultura digital. Trust Chair Nina Czegledy is working on a number of projects. As well as co-ordinating the participation of Inuit Nunavut artists Jesse Tungilik and Stacey Aglok Macdonald at SCANZ 2015 and driving the 2015 Walking Symposium, she has co-ordinated special international sessions of SCANZ symposia at previous events. She also organised Space sense a joint Canada-New Zealand project which included a residency period at Banff. The resultant work Atmosphere and Areosphere with collaborator Janine Randerson was showcased during SCANZ 2011: Eco sapiens, projected on the New Plymouth Observatory dome. Interdisciplinary creative projects include Sharing the Waiwhakaiho (waiwhakaiho.org.nz) a major project in partnership with Massey University, the National Institute of Water and Atmosphere and Taranaki Regional Council. This included a suite of creative projects, the website and a documentary based on diverse individual, academic and community groups use and experience of the Waiwhakaiho River. The Park Speaks involved a team of collaborators where live environmental data controls audio created by indigenous groups and individuals world wide. The system was built by Ian Clothier, Andrew Hornblow, Julian Priest and Adrian Soundy. Commissioned by Puke Ariki in 2009, The Park Speaks used live data from Pukekura Park, a networked botanical garden managed by Chris Connolly of the New Plymouth District Council. From the initial system implementation, capacities and audio was developed further for the Wai exhibition in 2012, where data from a Puka tree in Opunake New Zealand controlled audio heard in the 516Arts Gallery in Albuquerque. Then in 2014 the same system was used to connect a tree in Noosa Australia and the tree in Opunake New Zealand, using their live data to control audio. This was presented at the Balance-Unbalance international conference with the project becoming known as World Tree Ensemble. In 2015 the same system was used in Kauri flow, with nutrient flow data from a diseased kauri on the Colin McCahon House Trust property and healthy saplings in Te Uru Waitakere Gallery controlled audio that now incorporated Nunavut throat singing and Maori chanting. Haiku robots was a robotic art work in collaboration with engineer Andrew Hornblow and Julian Priest as software author. It generates word lists letter by letter live and dynamically and was also exhibited in Puke Ariki. Branch on branch was an augmented reality artwork in conjunction with the Human Interface Technology Lab NZ. Please contact Ian Clothier, Nina Czegledy or Trudy Lane for any enquiries.